Three Productivity-Producing Products – Love. Life. Practice. I talk a lot about various things I try out, and I don’t always follow up on how they work out. However, there are three things that I’ve been using that have really made a significant difference in the way I work, the things I accomplish, and more. I wanted to share them simply because one of the missions of this blog is to provide “practical tools to make hard times happier.” These three things definitely fall in that category. And yes, they are next to affiliate links, just so there’s full disclosure. Simple reminders are often the best. I can remote-control the music playing on my phone, or answer the phone (especially handy if my phone isn’t ready to hand). All the alerts are vibrating – which means my notifications no longer interrupt conversations, music, etc. Life is quieter. It’s almost more useful in the things I can’t do. I can’t really surf the web. I can’t really look at pictures, or twitter, or read facebook. I can receive texts, but I can’t really reply to them (except maybe through the “Yo” app). And it has one killer app for me: a pomodoro timer, pictured at left. 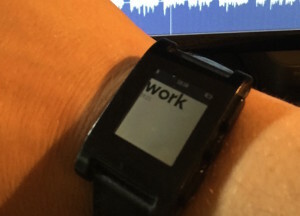 The screen slowly fills with black for 20 minutes, and every minute my watch “taps” my wrist – just enough to remind me to focus on work. Then it switches to “rest”, and so on – and when I stop it, it shows me how many cycles I did. 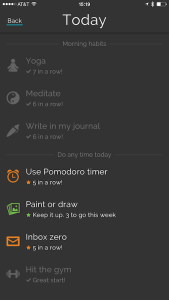 This one tiny app has me doing more focused work than anything else. 2. Productive (the App): A while back I was talking about how Chris Brogan recommended some “chaining” apps for habit change, and I mentioned I was going to give “Productive” a try (because at the base level it’s free). Turns out it’s a better app than I expected: multiple times I’ve only done whatever thing I was trying to keep a habit because of that annoying little colorful icon. It’s dead simple to create a habit, and to mark it off. Yes, you could do the same thing with a calendar, a notebook, a piece of paper – I’ve used all of those things, and this is the thing that’s worked the best, simply because it does one thing and does it very well. 3. KeySmart: There’s a lot of talk these days about the idea of “microagressions“. One of the similar phenomena is what I call “microaggravation” – tiny inconveniences or frustrations inherent in the systems of your life that cumulatively build up to affect your mood and generally decrease your slack. 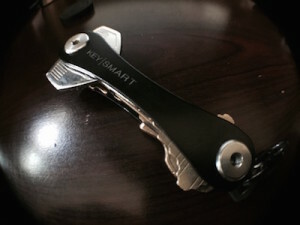 One of the most effective triumphs over microaggravation I’ve found is the KeySmart. It’s simply this: when I come to my door, there is no searching for the key. None. I know exactly where each lock key is, and I just reach for it – no jangling, no searching, no nothing. I know. What’s the big deal, Gray? But I think that’s the thing about microaggravation: you don’t actually notice it until it’s gone. I didn’t realize how much it was frustrating searching for the right key until I borrowed Natasha’s keys one day. Suddenly my beautiful system was gone…and I realized how much I dreaded being back in the “where’s-the-key” zone. I wish – oh lord how I wish – that I’d had this back when my kids were babies. Groceries, kids, maybe a phone ringing and you’re trying to open the door? On the other hand, it means I’ll never have that scene in the thriller where the person is frantically fumbling for the right key on a large ring. Nope, I’ll just pop out the right one, and totally ruin the dramatic scene. Those are my three most practical tools for making life happier lately. What’s yours? I have taken to embracing my technology and making it work with my “dumb” systems. Trello tracks my projects and keeps associated documents, it lines up with my hard-copy system of daily files where I shuffle related paper from day to day based on when the next action step comes. My Microsoft Band integrates with my calendar, in Outlook, gives me reminders (silently), timers, and access to the Cortana interface on my Surface (which links back through my Trello and Outlook). I use my Microsoft Band as my alarm – no loud noises in the morning – and an old-school christmas tree timer hooked to an oil-diffusing salt lamp set 15 minutes before my Band goes off in the morning. Cheaper and just as effective as a sunrise alarm clock, and smells better too. “Oil-diffusing salt lamp”…now I have to look that up. It sounds pretty amazing, especially if it’s better than those ridiculously priced sunrise clocks. Nice to hear that the Band works well – there are a lot of hit-and-miss fitness trackers out there, and when they get one right (like Misfit Shine, in my opinion) it’s good to spread the word. Thanks! The Band does a lot of things well (of course, being bought into the microsoft ecosystem has benefits for me) but I like that it is more than a tracker. People call it microsoft’s answer to the apple watch, but for me the limited functions it has are perfect for my needs. And the data it collects on my workouts and sleep patterns has helped me to make small changes in my routines to better function. I know what my optimal heart rate should be working out now, I know that I get better sleep if I go to bed closer to 10 than 9. I know that only being able to see my next 5 calendar appointments means that I get less overwhelmed when looking at my week. And I keep coming back to the blessed SILENCE of it. The salt lamp is just one that I picked up from one of those “import” stores with a small appliance bulb in it, and a small glass dish for essential oils located above it. The light is soft and diffuse, and waking up to the smell of wintergreen or rosemary is invigorating without being overwhelming.